Slim TWO is a simple way to replace your average toilet seat with something that will ultimately improve your everyday life and offer you a healthy alternative to toilet paper. Bio Bidet has raised over $100,000 on Kickstarter, exceeding its funding goal of $25,000 for a new smart toilet seat, Slim TWO, that is packed full of features. Slim TWO offers consumers a luxury bathroom experience with customizable settings and high end finishes. Slim TWO includes high end features such as a heated seat, heated water, stainless steel construction, a night light and more. The smart toilet seat also offers soft closing, turbo wash, a wireless remote and self clean mode, which helps users worry less about keeping their smart toilet seat clean. All Slim TWO features are fully customizable from water pressure and temperature to a wide clean mode. All Bio Bidet products are designed for simple, do-it-yourself installation. Unlike standard bidets, Slim TWO works with any home’s existing plumbing. Each Slim TWO smart toilet seat comes with a four-foot power cord to connect to an outlet as well as all other installation materials. If the user manual and installation guide leaves users with any questions, Bio Bidet’s customer service representatives can help over the phone at any time. To easily upgrade any home, pre-order Slim TWO by Bio Bidet on Kickstarter for $169. To learn more about the product, visit bit.ly/BioBidetKS. Located Northwest of Chicago, Bio Bidet aims to bring users a healthier alternative to their everyday bathroom routine. 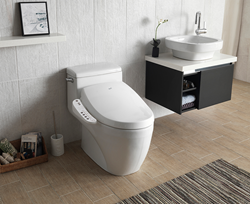 Bio Bidet’s products are designed to be installed onto an existing toilet and include all parts needed for installation. Setting themselves apart from other bidet lines with their affordable cost, Slim TWO helps users eliminate waste and increase a more hygienic lifestyle. For more information about the Slim TWO Smart Toilet Seat or Bio Bidet, visit http://www.biobidet.com/.